Even a freshly-loaded copy of Mac OS X Leopard can be slimmed down to leave more room for your files and programs. 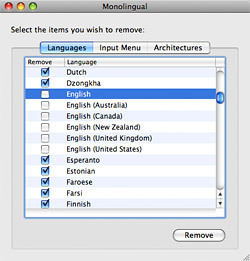 Remove unneeded languages and architectures from your Mac’s hard drive with Monolingual. Veteran Mac users likely know all about this useful little program, but newer converts may not be aware of its benefits. Put simply, Monolingual is a free utility that removes all of the junk that comes packaged with applications for compatibility purposes. Developers want their software to work for as many people in as many regions as possible, which ultimately leads to bloat. But you don’t need that bloat because you’re only concerned with what works for you and your Mac. Why carry the weight of others? Believe it or not, the second thing I did to my brand new MacBook Pro this week (after installing a boatload of Software Updates) was download and run Monolingual. Not a single piece of 3rd party software was installed at the time – just the operating system, iLife ’09, and iWork ’09. When Monolingual was done doing its thing, my Mac’s footprint was 4.5GB smaller. It was a pleasant surprise to say the least. The two main areas we’re going to focus on with Monolingual once it’s installed are removing language packs and outdated architectures. As you can see, this program has quite a long list of languages to look for. Since I’m an English-only speaker, I put a check next to every single language as I went down the line (except English). Just to be safe, I left the country-specific versions of English unchecked as well. Before clicking the “Remove” button it is important to note that some applications such as Adobe Creative Suite or Microsoft Office might break if language files are altered. Going to Monolingual > Preferences in the menu bar allows you to add exceptions for these special cases. Once they’re there, just uncheck the Languages and Architectures boxes next to them. This will stop Monolingual from messing with those programs. Clicking “Remove” now will start the process, and it may take a while. By the time it was done I saved 3.8GB! Moving on to system architectures, it is well known that all new Macs from the past three and a half years are Intel-based. But Macs built before this time ran on PowerPC processors. Many applications, especially the ones made by Apple, are Universal Binaries – meaning they contain both Intel and PowerPC code. By removing the architecture your Mac doesn’t use, you can recover even more disk space. 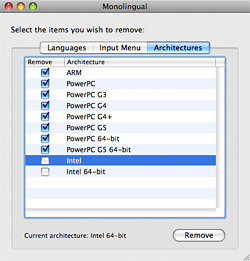 So if you’re on an Intel Mac, click the Architectures tab in Monolingual and put checkboxes next to everything but Intel and Intel 64-bit. Don’t worry about some of your legacy applications that are PowerPC-only and run in Rosetta. Monolingual is smart enough not to remove the PowerPC code from those programs. Click “Remove” to let the software work its magic and you might save an additional 700MB like I did – or more! Even as hard drives continue to get bigger, our digital lives keep taking up more disk space as well. As a result, any chance we have to save disk space is worth taking. This is even one of Apple’s main focuses with Mac OS X 10.6 Snow Leopard, which is due in September and said to be 6GB slimmer than 10.5 Leopard. Monolingual is a great help in this area and can leave you with more room to store photos, music, videos, and other documents that seem to accumulate at ridiculously fast rates. Man, that is awesome!!! One of the best pieces of software i have downloaded this year!! My macbook has been really slow recently, so this will hopefully help a little bit! Hi, I’ve also done things like this when I found my disk space was full and I try to use third-party applications such as CleanMyMac. In the left column there are several options, among others, Language Files and Universal Binaries. when I scan and remove, some applications that need rosetta running slow! Why is this happening? This was the worst technical problem I’ve had in 22 years of almost daily mac usage! An article promoted Monolingual to optimize performance. So, I tried it out last night. Several of my apps would not launch so I tried to reboot. Except I couldn’t because my computer would not boot up. I had to re-install OSX Snow Leopard from the disk, then ran all the updates. I spent many, many hours today restoring applications from my TIme Capsule. Thank goodness, I had backed up yesterday afternoon! Do you have to keep Monolingual in stored or once you have removed other languages can it be deleted?